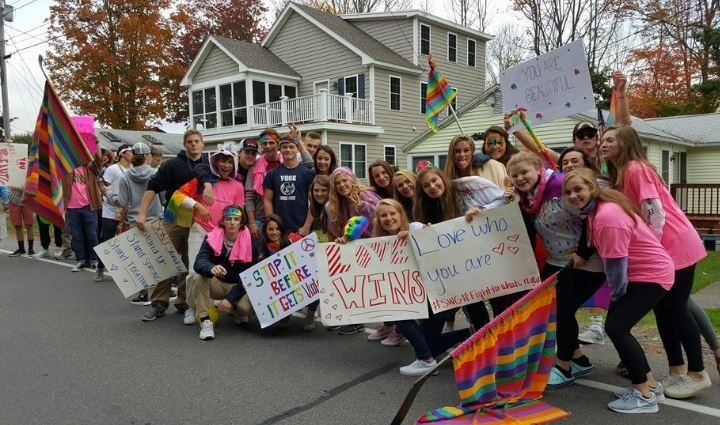 More than 200 students and parents turned out Monday morning to support York High School student Garrett McCann, wearing a headband in the photo above, who said he's been the target of bullying at the school because he's gay. Some of the 200-plus student demonstrators outside York High School Monday morning. The demonstration was held to support a classmate who was the alleged target of bullying. 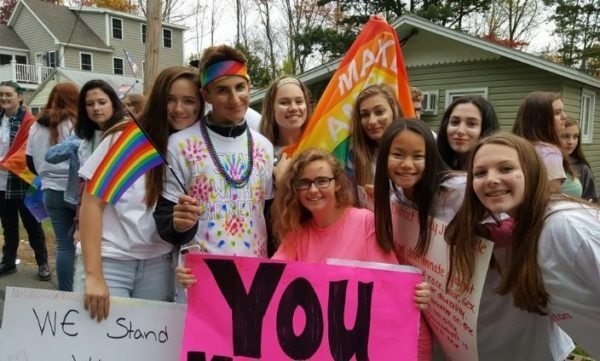 More than 200 York High School students bearing rainbow flags and carrying signs rallied across the street from the school Monday morning, in support of a 14-year-old gay student who has been the target of bullying. Meanwhile, the bullied student’s older brother is facing criminal charges, according to his family, after he engaged in a physical confrontation with one of the alleged bullies. The rally began at 6:30 a.m., with well over 100 students remaining past the start of school and vowing to remain there all day in support of not only the student himself, who came out as gay over the summer, but of all students who are gay, lesbian or bisexual. Subsequent to that meeting, the student’s older brother, also a student at York High, “physically assaulted” one of the students, Francis said in his email. “It appears now that the assault was a retaliatory measure,” Francis said. Police were called to the school and the older brother was subsequently placed into custody. York High School principal Karl Francis said he was please to see student involvement on the issue of bullying at YHS. York police Sgt. Brian Curtin confirmed Monday that there was a juvenile student involved in an altercation at York High Friday which resulted in the student being charged with assault. He could not confirm the student’s name because he is a juvenile. Curtin agreed. He also lauded the work of fellow officers, who were on hand Monday to answer questions, to explain their role and to provide support. In a statement that students handed out Monday morning, students said in part, “We are standing out here today to rally for EVERYONE being bullied, to spread a positive message of gay pride, to stand for the LGBTQ+ community and to bring awareness to hate crimes. Specifically, they have asked the administration to strengthen the consequences for bullying as outlined in the student handbook, similar to those imposed for drug and alcohol infractions. Francis agreed “there is room for improvement. I think they’re right. There needs to be more specific consequences.” He said he’ll work with the School Committee and other stakeholders to bring about the change. Senior Sophie Blanchard, who met with Francis, interim Superintendent Mark McQuillan and York police Monday, said bullying can seem intractable. “I think the problem is that it’s difficult for kids to speak up when they see bullying, because they’re afraid they are going to be a target, too. It’s scary for us to talk about this.” As a result of this situation, the senior class has made a commitment to “come out and talk to the student body. It will be better coming from us.” An assembly is planned for later this week. Tim McCann said he appreciates the students’ decision to rally Monday, and he and his wife came to the rally site to offer encouragement.